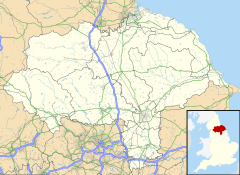 Colburn is a town, suburban area, civil parish and electoral ward in the Richmondshire district of North Yorkshire, England. It is approximately 2 miles (3.2 km) west of Catterick village and has a population of 3,606, rising to 4,860 at the 2011 census. The village takes its name from the first settlers along the stream Colburn Beck. It means "cold stream," "coal stream" or "cool, black stream" and is a mixture of Old English and Old Norse (Col, Kol and Burna). A "burn" refers to a valley that has been eroded by flowing water. The Colburn (Coburn) family is widespread around the world, including Edward Colburn, great grandfather of Reuben Colburn, who came to America in 1635 on the ship "Defence" part of the Puritan Great Migration of the 1630s led by John Winthrop. The name Colburn is used to describe both the small, ancient village to the north and (more frequently) the large, suburban housing estate to the south, known also as Colburn Lane Estate. Surrounding areas of Colburn include Walkerville, the Broadway Shops and Richmondshire Walk. A Sports and Recreation centre opened in 2004 gives the people of Colburn a place to relax, exercise, and play a number of sports, including football. In 2005, Colburn was at the centre of fierce local controversy over plans by Richmondshire District Council to build new offices for itself on a business park developed by the council but which has stood empty for a number of years. The new offices are budgeted to cost 4 times the value of the existing council offices so the council are to build flats in town centre car parks in nearby historic Richmond to fund the move. The move did not go ahead. In 2007, Colburn celebrated its 50 years by holding a number of events, from pantomime to quiz nights. Colburn lies within the parish of Hipswell and is served by St Cuthbert's church, Colburn Lane, Colburn. ^ UK Census (2011). "Local Area Report – Colburn 2011 Census Ward (1237325130)". Nomis. Office for National Statistics. Retrieved 16 March 2018. ^ Ekwall, Eilert (1960). The concise Oxford dictionary of English place-names (4 ed.). Oxford: Clarendon Press. p. 116. ISBN 0-19-869103-3. ^ "Decision urged on car parks sale". BBC News Online. BBC. 8 June 2005. Retrieved 8 July 2008. ^ "Hello and Welcome". The Churches of Hipswell Parish. Retrieved 7 June 2010. Wikimedia Commons has media related to Colburn, North Yorkshire.